Second-largest city in Canada is heart of our neighbor’s brewing revolution. There’s something about Montreal. Maybe it’s the city’s bilingualism. Maybe it’s the multiculturalism. Maybe it’s the infusion of youthful energy that stems from having the highest concentration of college students in North America. It’s hard to peg, but there’s something different about Canada’s second-largest city. That explains how the city gave rise to the likes of Cirque du Soleil and Arcade Fire, how it came to host world-class festivals such as the Montreal International Jazz Festival and Just for Laughs, as well as how it came to be the center of Canada’s craft brewing revolution. 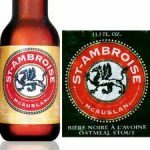 For more than a half century, the lion’s share of beer that Canadians drink has come from two breweries — Labatt and Molson — both of which are now owned by the same two mammoth corporations that dominate the American beer market: Anheuser-Busch InBev and MillerCoors. Just as the American craft beer movement began in California with breweries like Anchor Brewing and Sierra Nevada producing beers that were unlike any others on the market, the Canadian movement was begun in and around Montreal, by the likes of McAuslan and Unibroue founders Andre Dion and Serge Racine who, sparked by the creative vibe of the city, sought to produce beers more like those they had tasted in Europe but that were unknown or obscure in Canada.